Robert Manning died at 10:45 Sunday night, at the home of his brother, John Manning, of College Street, after having been confined to the house five weeks with stomach trouble. 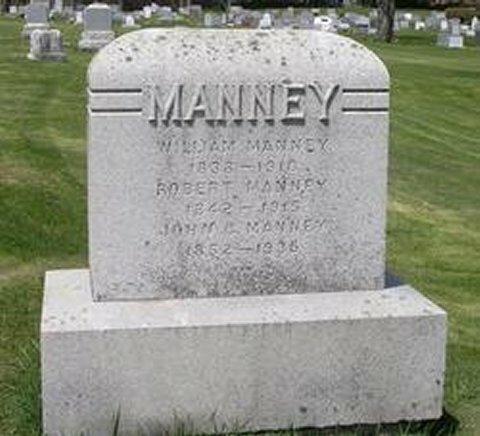 Mr. Manning was a son of William and Ann Manney, and was in the 73d year of age, having been born in Middlebury, February 6, 1843. In younger days he devoted his attention mostly to farming, but in 1862 he enlisted in Company C., 7th regiment, in which he served three years. Mr. Manney was in business for about eight years with the late Byron L. Fleming, and for 22 years was associated in business with the late Ira Taylor of Middlebury, who died recently. Funeral services were held at 2 o'clock Wednesday at the Methodist church, Rev. D. H. Corkan officiating. The Grand Army ritual was used at the grave. The bearers were;William L. Cady, James M. Tracey, Louis Goulette, Walter Martin, Patrick Halpin, and Harrison Whittemore. The ladies of Russell Circle conducted the flag service at the church.